From Golden Spike RV Park, Brigham City, Utah Our week at Park City, Utah, and indeed our seven months of group travel, ended on yet another cool, rainy day. 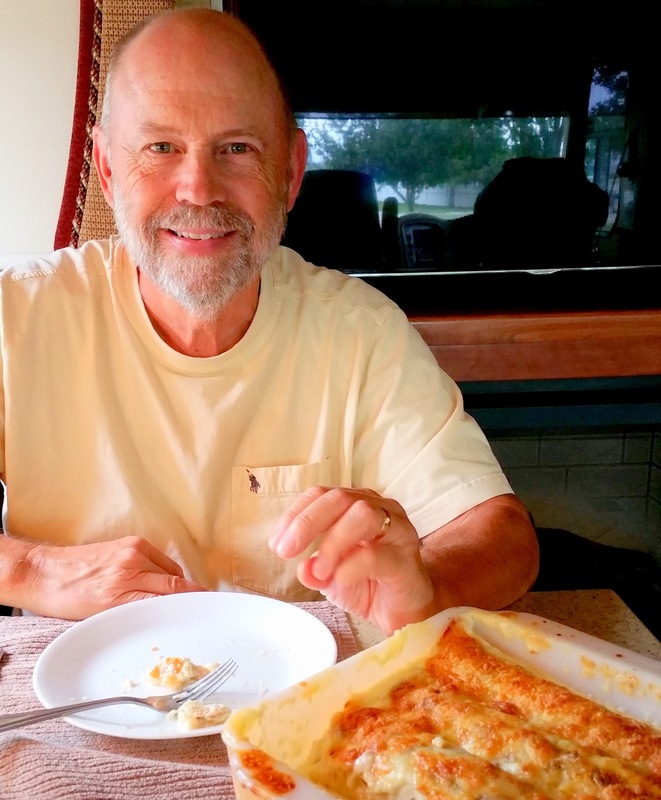 Sweet Joyce surprised Wayne and me our last morning with a parting gift of her delicious homemade chicken enchiladas. They came ready to bake, along with chips, dip and the precious enchilada recipe. Goodbyes are tearful for us so Joyce, Pam and I tried to keep our conversation light and happy that morning. 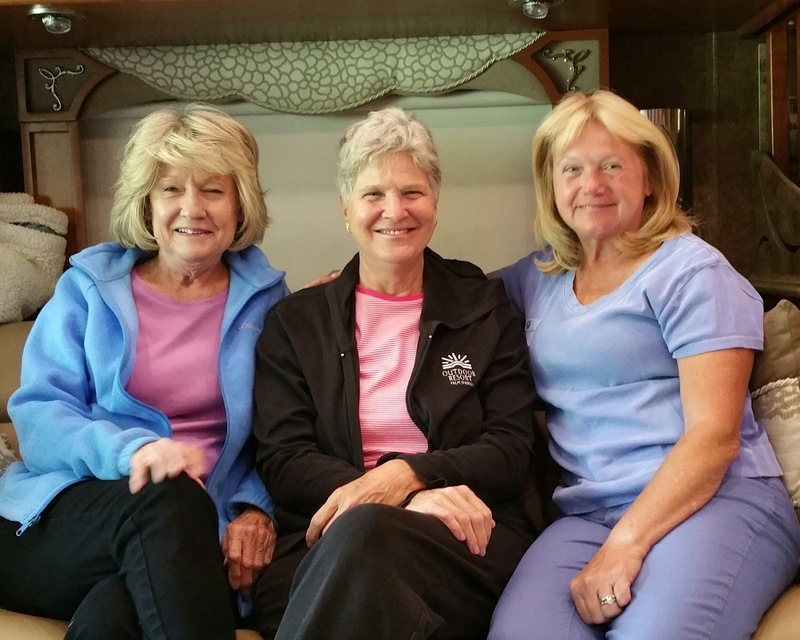 Here's our last girl group photo -- it was taken in Pam and Ernie's coach. The previous weekend, Lexie's health had become a concern again, so we started her on strict crate rest again. We were still convinced the problem was spinal. Her walks were very short -- just a few short steps to do her business and then back into the crate. Confined, she seemed to feel better. 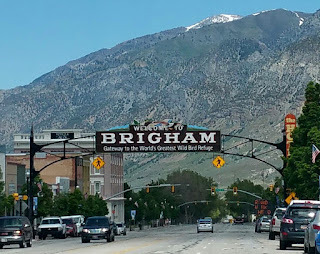 Mid-morning we were gone, heading north to Brigham City where we hope for warmer temperatures if not a bit more sunshine. Elevation here is a full 1,000 less than Park City. The town is small but pleasant. 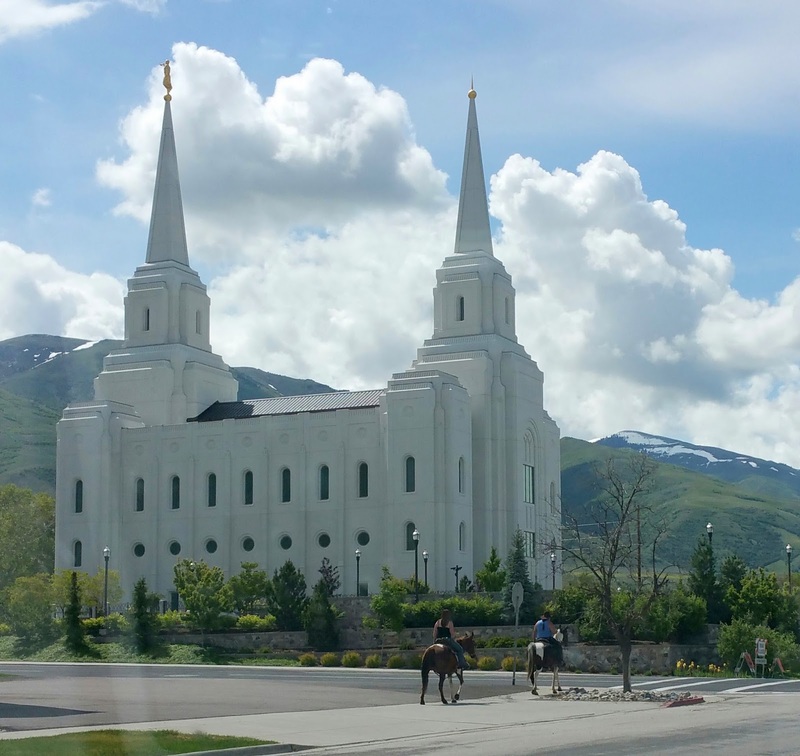 Everything here revolves around the Mormon Church. By far, this church is the finest building in Brigham City. This photo was taken on a Sunday morning. We arrived at Golden Spike RV Park in plenty time to bake Joyce's enchiladas for an early dinner. Yum. 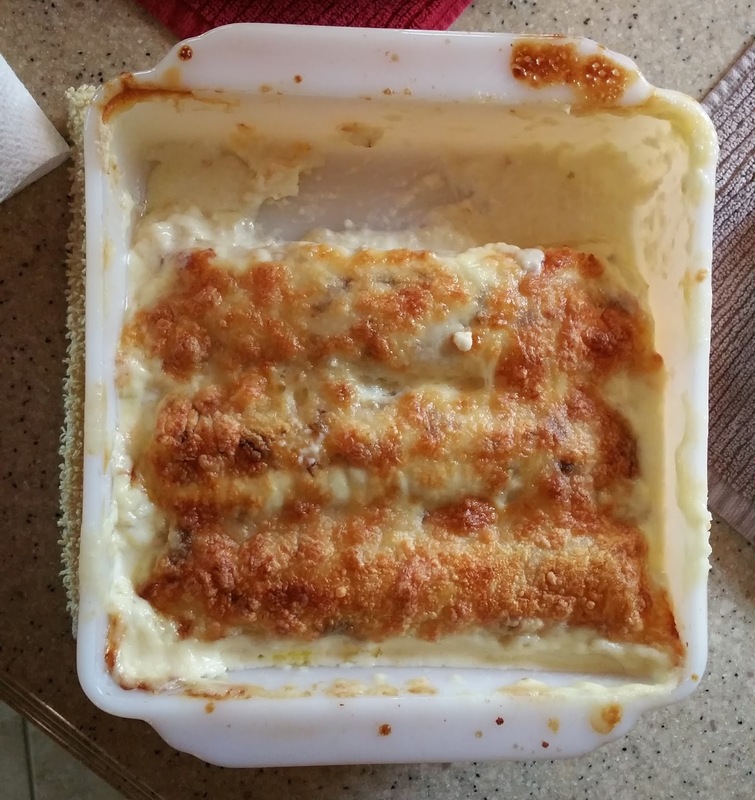 They were good, cheesy and warming. I tried not to think of the calories and cholesterol. I'm down thirteen pounds and anxious to keep them off. Chicken, cheese, heavy cream, cheese and more cheese. So rich, one is enough, along with a salad. 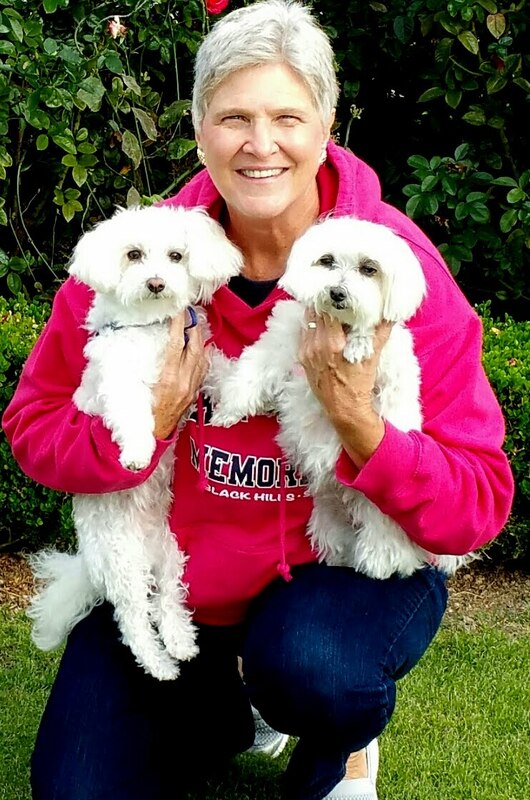 The first few days at Brigham City, were filled watching Lexie and doing housekeeping chores, including making a change in the sleep arrangement for Lexie and Ozzie. That called for a visit to the local Ace Hardware where we found a nice thin but sturdy board to put under our mattress. At night, we simply slide the board part-way out and put their beds on it with the wall to support the other side. We also did some de-clutter work that resulted in a couple of visits to a local charity. The fire pit we bought in Gulf Shores last fall was among the donated goods. No place to store such an infrequently used and dirty item. The location of the final spike driven into the steel that completed the transcontinental railroad is at Promontory Summit north of the Great Salt Lake and 32 miles west of Brigham City. The location is designated as a National Historic Site and Monument. We scheduled a day to go, taking Lexie (crate and all) and Ozzie with us. The day was mostly overcast and plenry cool for them to remain in the truck during the short time we were there. 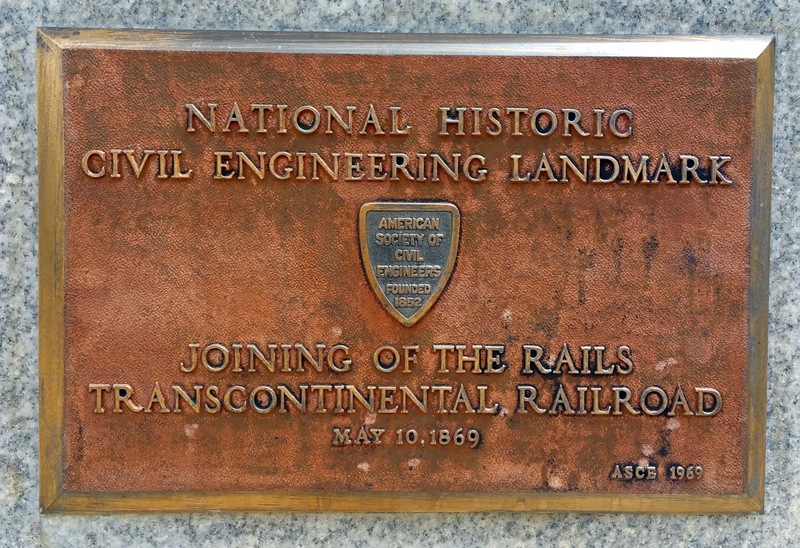 In 1862 Congress authorized Central Pacific and Union Pacific Railroads to undertake the mammoth task of connecting the two halves of the American continent. A central route near the Mormon Trail was chosen with Omaha as the terminus. Each railroad company received subsidies ranging from $16K to $48K per mile of railroad built, depending on the level of difficulty of the terrain covered. Central Pacific broke ground in January 1863 and Union Pacific, the next December. 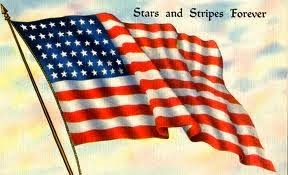 Progress was slow and most of the country's attention was on the Civil War. Central Pacific crews struggled through the Sierra Nevada range and there were raids by the Sioux and Cheyenne. Material had to be shipped around Cape Horn. Workers were driven relentlessly until they could routinely lay two to five miles of track in a day. The laborers in the railroad building effort were diverse: Union Pacific Railroad worked America's unemployed -- Irish, German and Italian immigrants, Civil War veterans, ex-slaves and American Indians. This volatile mix brought bloodshed and drunken brawls in the "Hell On Wheels" camps thrown up along the way. Because of the drain on the California labor pool for the gold and silver booms, Central Pacific Railroad hired mostly Chinese immigrants who became the backbone of the company's work force. 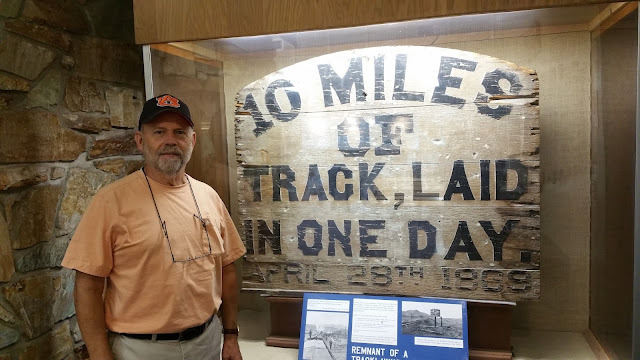 While railroad workers didn't always get along, they were effective in laying track that always measured exactly four feet, eight and one-half inches apart. They joined two oceans and cemented the political union of the country with a physical link that snaked across hundreds of miles of sparsely settled land. It was a formidable task. The two railroad companies raced toward one another through Utah, each hoping to claim more land subsidies. They pushed so hard that, at one time, they drove workers nearly 200 miles in opposite directions on parallel grades. Finally Congress declared the meeting place to be Promontory Summit. On May 10, 1869, two locomotives -- Central Pacific's Jupiter 60 and Union Pacific's 119 pulled to the one-rail gap left in the track and the symbolic golden spike was tapped into the rail. I never saw an explanation as to why the "purpose built" Jupiter 60 replica was not on site. In the end, Central Pacific had laid 690 miles of railroad and Union Pacific laid 1,086 miles. Combined, they crossed 1,776 miles over desert, rivers and mountains, including the Rockies. The locomotive makes regular runs for visitors to the site. They merely fire up the the engine, back it up a ways and return it to the monument site. Engraved on the Golden Spike is "May God continue the unity of our Country as this Railroad unites the two great Oceans of the world." 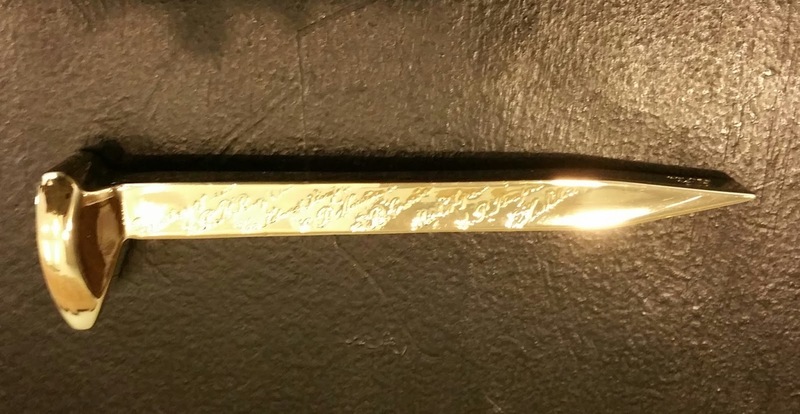 The gold colored spike in the photo below is just a replica. The original spike was removed from the rail when the ceremony was complete and is on display at the Smithsonian. 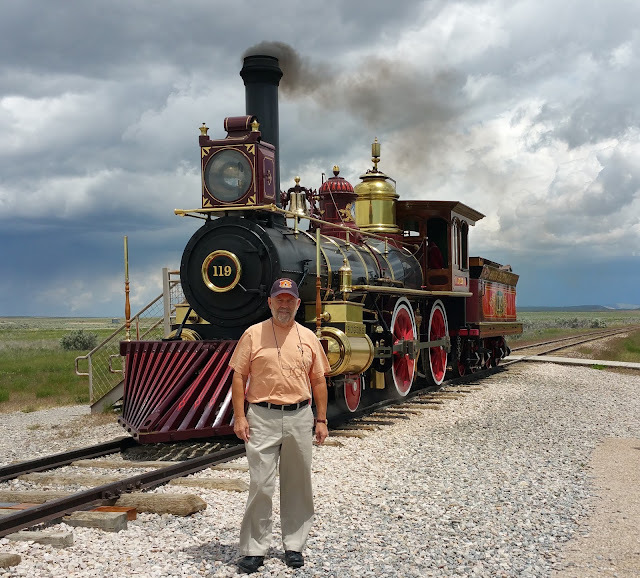 Following our visit to Golden Spike National Monument, someone on Facebook made reference to "Hell On Wheels" and the good looks of an actor in the television series. I didn't know what they were talking about. Wayne and I watched a few of the remaining A&E episodes but didn't find the show or the actor appealing. 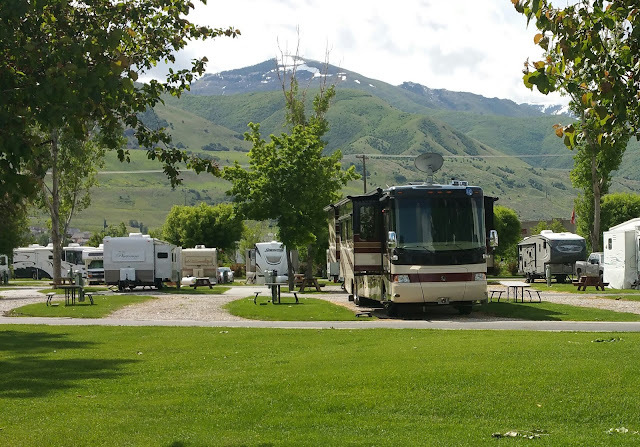 The stay at Golden Spike RV Park in Brigham City began as two days and turned into thirteen -- a frequent phononomen for us. The weather was warm for the most part and we had a good place to walk the dogs. Lexie remained confined to the crate but her back was sensitive to the touch. We both were worried. Our campsite at Golden Spike campground was quite pleasant, mainly because we were on the front row, facing out onto a nice green, treed lot with the street beyond it. The street in front of us made for a really good little dog walking place. I recorded this little video to share with Pam and Joyce when we first arrived. 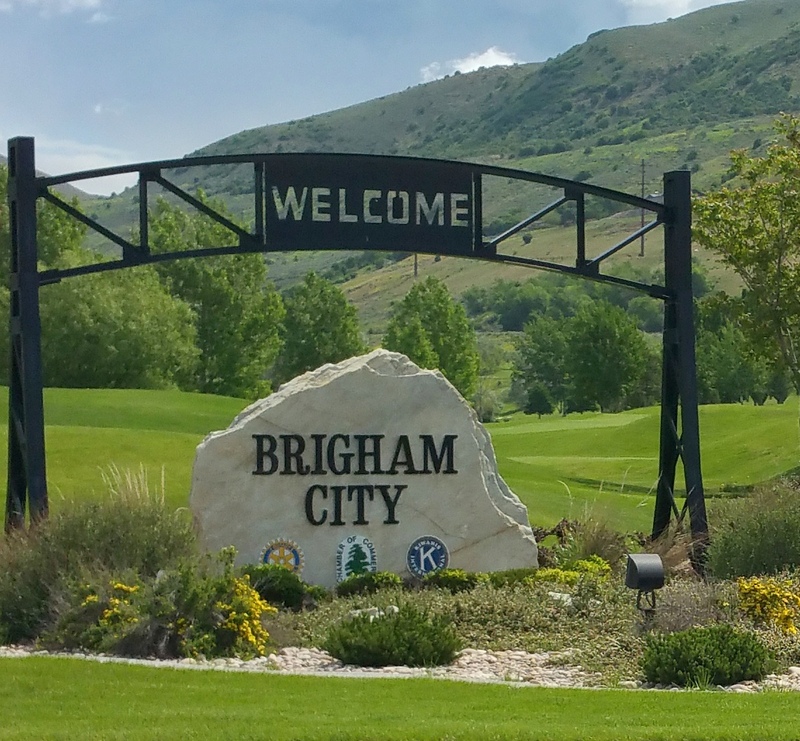 During our time at Brigham City, Joyce, Charlie, Pam and Ernie drove up from Park City one afternoon. We all enjoyed a really fine dinner at Maddox Ranch House Restaurant, although the wait for our table was long. It would be the final meal together for us and the end of our wonderful fall/winter/spring cross-country excursion together. Once more, Joyce, Pam and I managed to avoid a long, tearful farewell. I knew I would miss them and I did. The withdrawal was awful for several weeks. 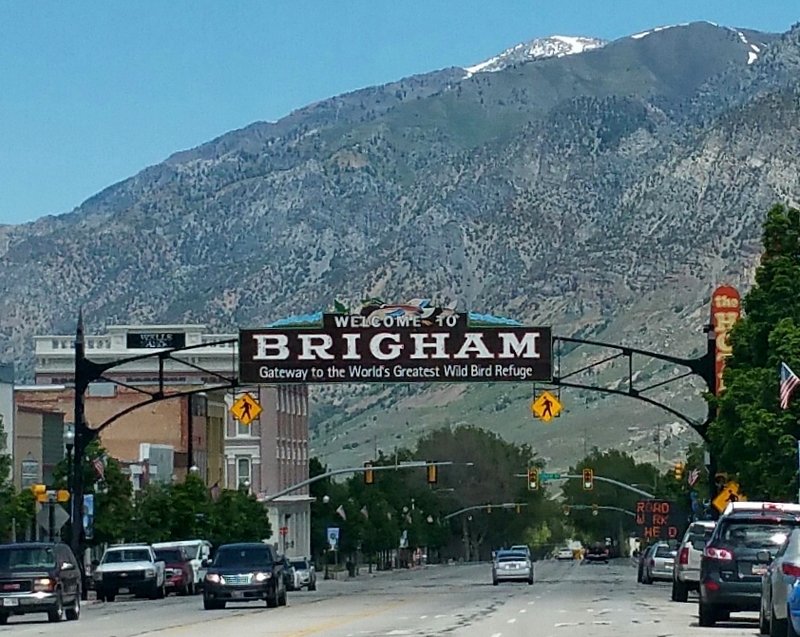 On Thursday, June 2, we finally left Brigham City, Utah in route to Montana for summer.